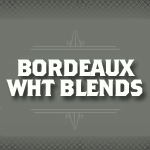 White Bordeaux Blends is a loose term referring to wines produced primarily with Sauvignon Blanc, Semillon, and Muscadelle grapes- varietals with origins in France's Bordeaux region. These wines are produced extensively in France, but also outside of Bordeaux. The wines tend to be light gold with flavors of citrus and vegetal barnyard flavors.